A Private Space is your own place in the cloud. It is hidden from all but you – and those you invite into it. It is a place to share and co-operate regardless of how far you are from each other, it provides security as if you were in the same office. Connecting to your Private Space is like entering a room only you have the key. It also casts its protective cloak on your computers and phones so no one can see which web sites you visit. We are planning three basic versions of Private Spaces and PS-Gateway is the first of them. PS-Gateway protects your connections to the internet, its users can also see each other’s computers and securely share data among themselves. PS-Place adds a secure document storage and photo galleries. Documents can be accessed with web browsers or “shared drives” suitable for office and other applications. PS-Hub also provides instant messaging tools, website, and an internal wiki system to share private or sensitive information. 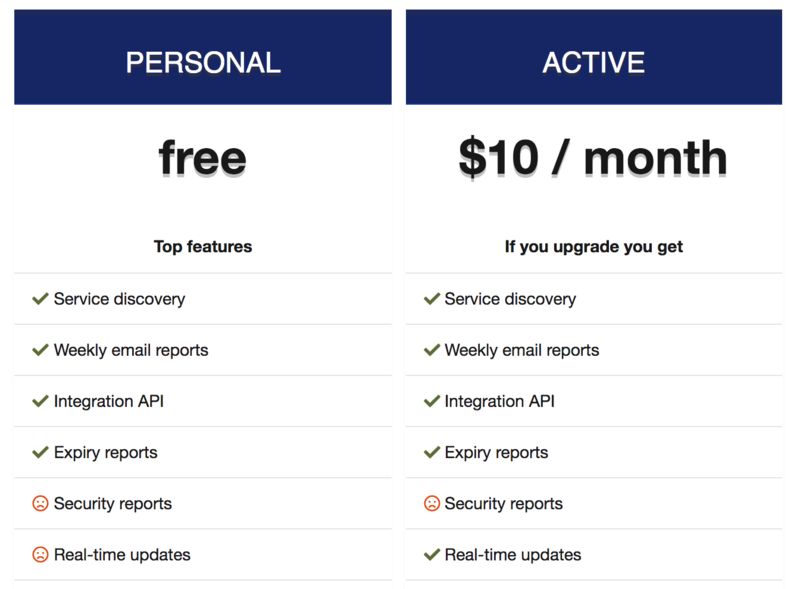 Your Private Space is only a few clicks away. 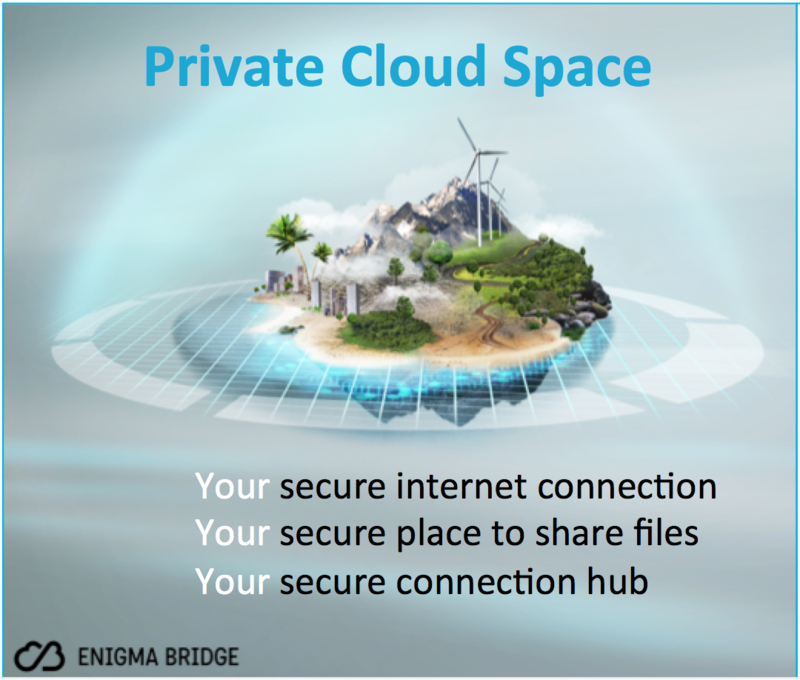 You need to sign-up at our website https://enigmabridge.com/spaces, verify your email address and your Private Space will be ready in minutes. When you use your Private Space, it becomes your Internet gateway. It creates a secure network (VPN) with your computer and mobile phone inside it. It protects you from insecure local computer networks and allows for private data sharing between devices inside the Private Space. 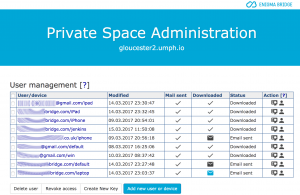 This is the basic list of options on Private Space servers. 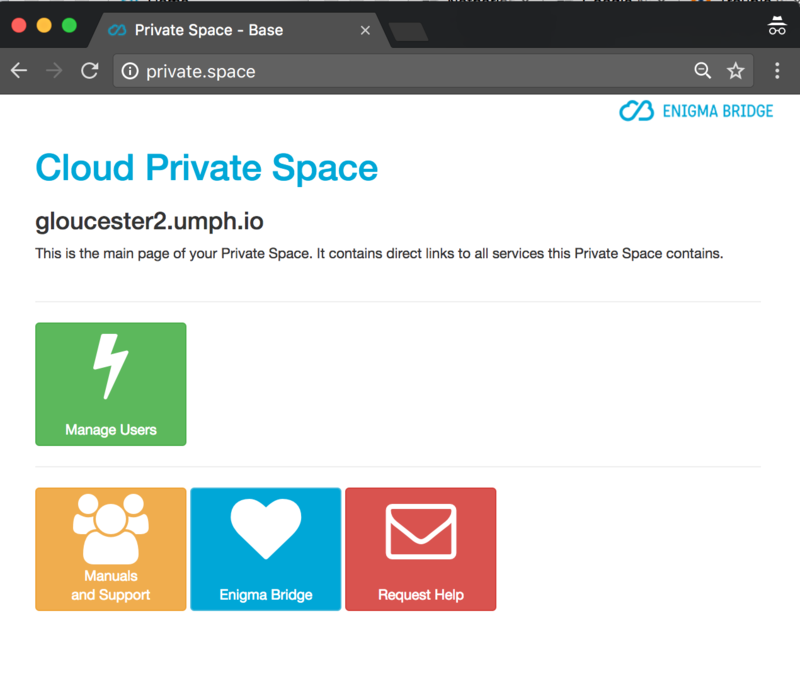 Each Private Space has its own server, which can provide a set of services – according to the type of Private Space you choose. You don’t need to remember password to connect to your Private Space. The security is provided with cryptographic keys created with specialized security processors. You will need a connection client, which can be any of the OpenVPN clients. Administrator can add and remove users. Removal is instant. 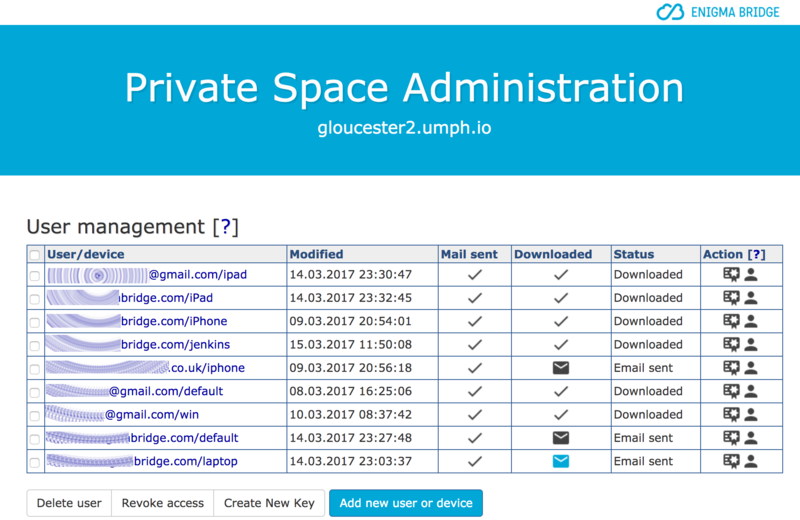 The first user is the administrator of the Private Space and can add and remove users as needed. The keys are sent via email, but mobile phones can also easily read them with QR code readers. Security of user management is based on a client-side HTTPS certificate, which you have to install first. It’s a bit of a hassle, but it provides excellent security. While we give you a nice internet name, you don’t really need to remember it. 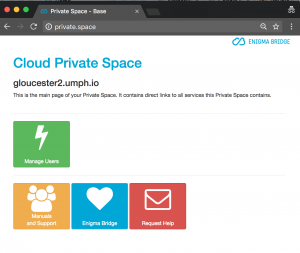 If you need to connect to your server, just type http://private.space into your browser. Once connected to your Private Space, you maximize security and privacy of your Internet use. Private Space is ideal for private communication and document sharing between users of the Private Space. Whether you send a document inside the Private Space, use Facebook, Google, or connect to your blog, anyone outside can only see you’re connecting to your Private Space. Your data security depends on many aspects. We always make sure that data in-transit (between your devices and Private Space) is secure. We use strong encryption algorithms. We also enforce access control inside your Private Space. The security of your Private Space depends on the security of connection keys. We create the keys with our Cloud HSMs. This prevents single points of failure compromising your security. We put a lot of effort into creating secure keys. No would not tolerate lock-picking or duplicate keys to your Private Space.